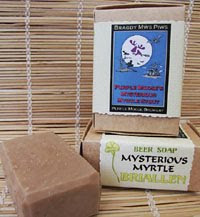 Elaine Jones of Briallen Crafts has recently introduced a range of handmade beer soaps. Briallen handmade Beer Soaps are made with beers carefully selected from local breweries in North Wales and include gently refined organic Shea Butter from a Fair Trade project in Ghana. The lather from these handmade beer soaps is absolutely fantastic! The first of the regular beer soaps is Cwrw Du (The literal translation of "Cwrw Du" is "Black Beer", one of the Welsh names for Stout). 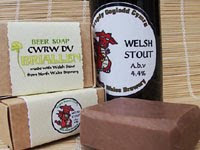 The stout used in the making of the Cwrw Du beer soap is Welsh Stout, a bottled stout from North Wales Brewery near Abergele. In the pipeline is another regular beer, the intriguingly named Dark Side of the Moose from the Purple Moose Brewery in Porthmadog. In the tradition of all good bars there will be Guest Beers in addition to the regular ones and the first is a Guest Beer for Halloween! "Mysterious Myrtle" made with myrtle stout from the Purple Moose Brewery - just once or twice a year Purple Moose brew a stout flavoured with the Bog Myrtle herb. I couldn't agree more. Handcrafted beer soap is wonderful. I love making it with Amstel Light.